Do you love waffles? Are you an ice cream fanatic? Now, here’s an exciting treat from Baskin-Robbins that combines these two well-loved treats in one delicious offering for the sunny month of March. The world’s favourite ice cream brand is offering the classic ice cream flavor that brings back that warm, happy feeling of indulging in a rich, golden Belgian waffle. 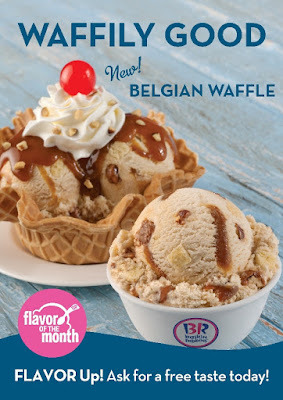 Baskin-Robbins’ flavour of the month is truly waffily good as it meldsmaple praline flavored ice cream with Belgian waffle pieces, praline pecans and a creme caramel ribbon. It has the authentic taste and texture of a real belgian waffleand is best paired with the classic Baskin-Robbins ice cream flavor, Pralines ‘n Cream. www.baskinrobbins.ph or check out their accounts: facebook.com/baskinrobbinsph, Twitter, and Instagram @baskinrobbinsph.